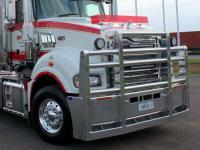 Mack Superliner FUPS Bull bar. 88mm dia pipe, 100mm dia pipe available. Chrome plate over tow hitch (can be painted black or to suit chassis). Heavy duty steel backing plate with tow pin.Indicator lights in channel. Full length box uprights for maximum protection. Reversible Road Train signs on alloy plate, cowcatcher and 5 small uprights. Bull bar can be custom built to your requirements. 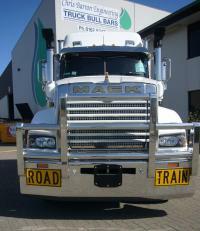 Mack Superliner FUPS Double Channel Bull Road Train bull bar. 88mm dia pipe, 100mm dia pipe available. Plate over tow hitch (can be painted to suit chassis). Heavy duty steel backing plate with tow pin. Indicator/Day light running lights in outer uprights. Full length 100mm wide box uprights for maximum protection. Stick-on Road Train signs with silver covers, cowcatcher and 3 small uprights plus sump guard. Heavy duty mesh to centre section to protect radiator. Additional light bar mounted to bonnet. Bull bar can be custom built to your requirements. 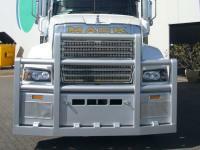 Mack trident FUPS hi-tensile polished aluminium Radar accessible Bull Bar. 88mm dia. pipe, 100mm dia. available. Indicator and daytime running lights in outer uprights, reversible aluminium Road Train-Long Vehicle signs with covers. Main uprights extend to the bottom of the main bar. Cowcatcher and 4 small uprights. Dual tow pins mounted in heavy duty high tensile aluminium backing plate. 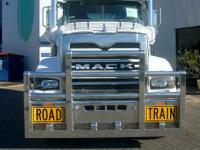 Mack Granite hi-tensile aluminium FUPS bullbar with reversible Aluminium/Road Train signs. Steel plate over tow hitch. can be painted black or your chassis colour or chromed. 88-100 dia pipe. Heavy duty tow pin and steel backing plate. Indicator repeater light mounted in main bar. Optional bug mesh on request. 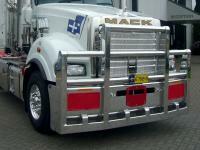 Mack Granite hi-tensile aluminium FUPS bullbar. Indicators and daytime running light in channel. Cow catcher and 4 small uprights. 88mm dia pipe, 100mm dia available. Heavy duty steel backing plate and tow pin. 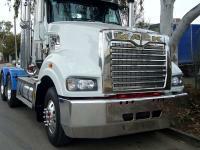 Mack superliner FUPS Bull bar. Cowcatcher and gussets behind cowcatcher. Steel plate over tow hitch can be painted black or your chassis colour or chrome. 88mm dia pipe, 100mm dia. available. Bull bar can be custom built to your specification. Indicator and daylight running lights in channel. Extra heavy duty steel backing plate and tow pin. 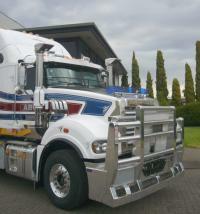 Mack Superliner hi-tensile aluminium FUPS bull bar with contoured main lower bar. Standard design. 88mm dia, 100mm dia available. Heavy duty tow pin and steel backing plate. Indicator repeaters mounted in main bar. Driving light mounts custom fitted as required. 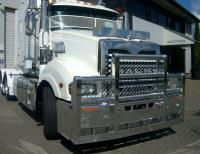 Mack Superliner hi-tensile aluminium FUPS Bull bar with cowcatcher and 4 small gussets. Extra pipe above channel. 88mm dia pipe, 100mm dia available. Uprights higher in front of grille and extended to cow catcher for maximum strength and protection. Indicator repeaters mounted in main bar, tow pin and heavy duty steel backing plate. 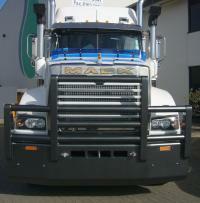 Mack Trident (set back front axle) hi-tensile aluminium FUPS Bull bar. 88mm dia pipe, 100mm dia available. Reversible aluminium Road Train signs fitted to contoured main channel with return to suit set back front axle. Heavy duty box uprights are set at 130mm clearance from the bonett Heavy duty tow pin mounted in heavy duty steel backing plate. Indicator repeaters mounted in main bar. Driving light mounts as requested. Provision for front mudflaps. Bull bar can be custom built to your specifications. 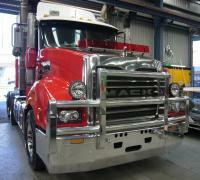 Mack Superliner FUPS Bull bar. 88mm dia pipe, 100mm dia available. Chrome plate over tow hitch can be painted black or to suit chassis. Indicator and daytime running lights in channel. Full length box uprights for maximum protection. 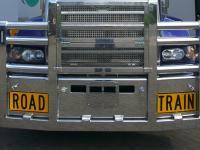 , Reversible aluminium Road Train signs, cowcatcher and 5 small uprights. Bull bar can be custom built to your requirements. 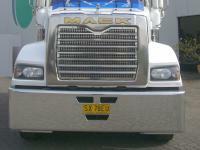 Mack Superliner hi-tensile aluminium FUPS Bull bar. 88mm dia pipe, 100mm dia available, extra pipe above headlights and middle uprights higher. Cowcatcher and 4 gussets. Heavy duty tow pin mounted in heavy duty steel backing plate. Driving light mounts fitted as required. Provision for front mudflaps. 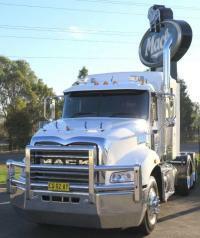 Mack Trident hi-tensile aluminium FUPS Bull bar. 88mm dia pipe, 100mm dia available. Security mesh bolted to back of uprights (can be chrome plated). Reversible aluminium Road Train signs, cowcatcher and 4 gussets. Heavy duty tow pin mounted in heavy duty steel backing plate. Indicator repeaters mounted in main bar. Driving light mounts as requested. Provision for front mudflaps. Bull bar can be custom built to your specifications. 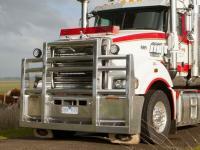 Mack Trident hi-tensile aluminium FUPS Bull bar. 88mm dia pipe, 100mm dia available. 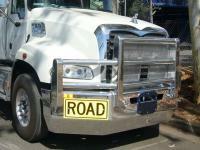 Reversible aluminium Road Train signs. Contoured lower main channel with indicator repeater lights. One piece cross pipes passing through drilled uprights and recessed into drilled outer uprights, no but welds. Mack trident FUPS hi-tensile aluminiuam Bull bar. 88mm dia pipe, 100mm dia available. Indicator and daytime running lights in channel, reversible aluminium Road Train signs. Cowcatcher and 4 small uprights. Tow pin mounted in heavy duty steel backing plate. 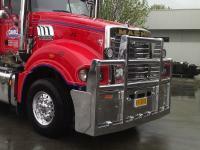 Mack Superliner FUPS Bull bar. 88mm dia pipe, 100mm dia available, stick on Road Train signs and silver covers (can be different colour). Indicator and daytime running lights in channel. Cowcatcher and 5 small uprights. Powder coated BP Horizon, can be different colours. Bull bar can be custom built to your specifications. Mack Superliner hi-tensile powder coated aluminium FUPS bull bar with contoured main lower bar. Choice of colours available as required. Standard design, 88mm dia, 100mm dia available. Heavy duty tow pin and steel backing plate. Indicator repeaters mounted in main bar. Driving light mounts custom fitted as required. 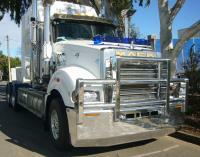 Mack Granite hi-tensile custom built aluminium FUPS bullbar. High tensile aluminium contoured main channel. High tensile 88mm diameter heavy duty 6mm wall pipe (optional 100 dia pipe available on request). Heavy duty tow pin and steel backing plate. Indicator repeater light mounted in main bar. Driving light or light bar mounts fitted to customer requirements. Optional bug mesh on request. 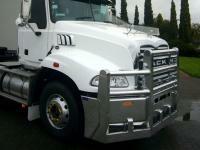 Mack Granite hi-tensile custom built aluminium FUPS bullbar. High tensile aluminium contoured main channel. High tensile 88mm diameter heavy duty 6mm wall pipe (optional 100 dia pipe available on request). Heavy duty tow pin and steel backing plate. Indicator repeater light mounted in main bar. Flip over Over-Zise signs on alloy plates. Driving light or light bar mounts fitted to customer requirements. 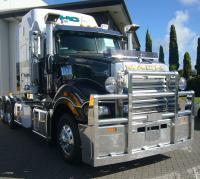 Mack Trident Fwd F/axle FUPS Bull bar. 88mm dia pipe, 100mm dia available. Indicator and daytime running lights in channel. Custom driving light mounts to customer requirements. The centre light bar will accommodate a LED Light Bar. Full length box uprights for maximum protection. Dual Dangerous Goods signs, cowcatcher and 4 small uprights. High tensile aluminium backing plate with 38mm tow pin. Bull bar can be custom built to your requirements. 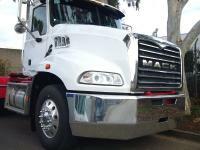 Mack Superliner hi-tensile aluminium FUPS Bull bar. 88mm dia pipe, 100mm dia available. Reversible aluminium Road Train signs. Contoured lower main channel with indicator repeater & daylight running lights. One piece cross pipes passing through drilled uprights and recessed into drilled outer uprights, no but welds. Tow pin protector plate. Heavy duty steel backing plate with 38mm tow pin. Driving light or light bar mounts can be custom fitted to your requirements. 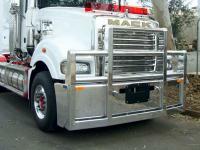 Mack Granite FUPS hi-tensile aluminium bumper bar with full side wrap round. 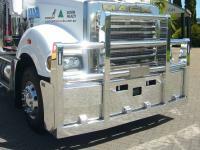 Mack Granite FUPS Superliner, hi-tensile polished aluminium bumper bar. 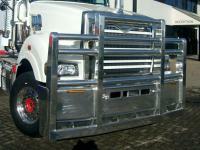 Bumper bar can be custom built to your specifications. Mack Trident Extra Heavy Duty Fups Bumper Bar. Main bar is fitted with extra gussetts to gain maximum protection and this is mounted on an extra heavy duty backing plate which is also fitted with a 38mm tow pin and provisions for front mudflaps.